DeCook Excavating, as a premier excavation contractor, provides commercial and residential excavation services and septic installation and repair in Rochester, MN, and surrounding communities. 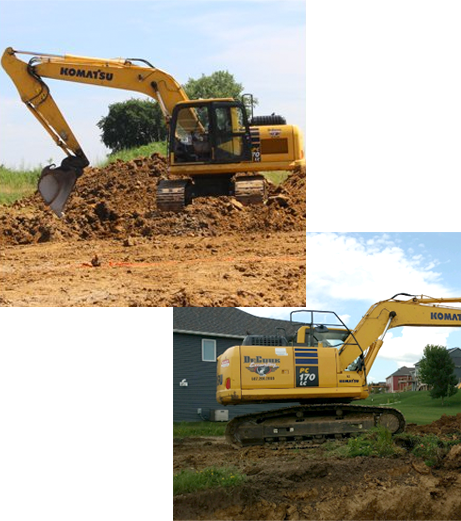 Our certified excavators understand the unique needs of southeastern Minnesota and will complete your project right the first time. From the beginning of your project through the end, we’ll handle every aspect of your excavation project as well as septic installation and repair. Our focus on superior customer service and outstanding job quality drives everything we do. No matter the size of your commercial or residential project, we’re committed from start to finish. We act as your partner and work with you to understand and deliver exactly what you’re looking for. Known for our strong Midwestern work standards, we’re here to assist you with any project you need from demolition to grading. With DeCook Excavating you can be confident you’ve hired the leading expert excavation contractors in the field. Our expertise stems from over a decade of experience and continuing education so we’re always meeting industry standards. Our equipment operators are highly trained, licensed, bonded, and insured. We’re proud to serve Rochester, MN, and the surrounding communities across southeast Minnesota. We work year-round (weather permitting) and are always happy to discuss your upcoming project to give you a FREE estimate. Ready to tackle your excavating or septic project? Contact us at (507) 361-4870 to get your FREE quote today!